Harrahan's third novel, Sanctuary, A Catalyst For Murder, is a fascinating sequel to Downsized, underscoring his reputation as a gifted storyteller. Murder and political intrigue are front and center in the third entry of his legal thriller series featuring Boston P.I. Bill Coine. A weekend getaway to Massachusetts Berkshire Mountains for Coine and his wife Jeanie ends badly when he follows the smell of death and finds a dead body hanging from a beam in the hotel room next door. The dead man is Fairlane Township's board of selectmen chairman responsible for the town's sanctuary ordinance protecting undocumented immigrants in the community. For lovers of Coine's adventures, this is a must read. In less than seventy-eight hours a harmless Boston bookie, Harold "Smokey" Goldman, is brutally murdered, a Brooklyn hit man, Joe Buscada, is found dead in an open grave in the Quincy Memorial Cemetery and Dan Riley, a prominent Boston trial attorney, is shot on the front steps of the John Adams Courthouse. Are these events related? And if so, who is calling the shots? Is it the mob? Or is it a vicious vendetta stemming from Riley's distant past in Brooklyn? Enter Detective Lieutenant Bill Coine, a relentless crime solver, who must contend with local politics and an international assassin known as the Scope. Coine, with the aid of the FBI, solves the case. But does it stop the killing? Bradford Baxton III, is the CEO of Amalgamated Worldwide Enterprises. 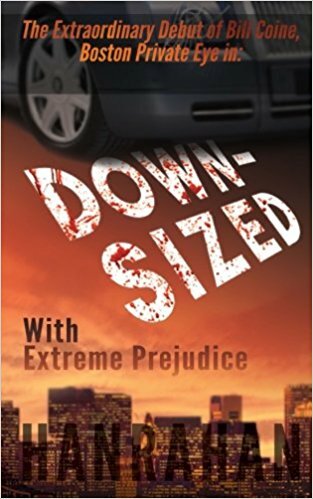 His ruthless acquisition policies earned him the title, "King of Downsizing."